Posted March 21, 2013 by davezumbekphoto & filed under About / My Views, Wedding Photography. I was recently asked to be the photographer for a local Semi-Pro (post college, pre AFL/NFL) Football team, the Tazewell Tigers. The gig itself did not directly pay, but promised exposure and the opportunity to sell prints. I decided to give it a trial run this past Sunday to see if the opportunity could live up to the promise. I arrived at the game, was allowed in free of charge, and was introduced to the team as the new photographer. I began shooting. I circled the field several times to scope out the best angles and capture all of the key plays. I started to notice a few other people with cameras taking pictures, but they looked more like fans, friends, and family. After second or third pass around the field, I noticed a photographer with 2 DSLRs and serious telephoto zoom lenses. This didn’t seem right to me as I was supposed to be the exclusive photographer, or so I was led to believe. I brushed it off and carried on with shooting the game. 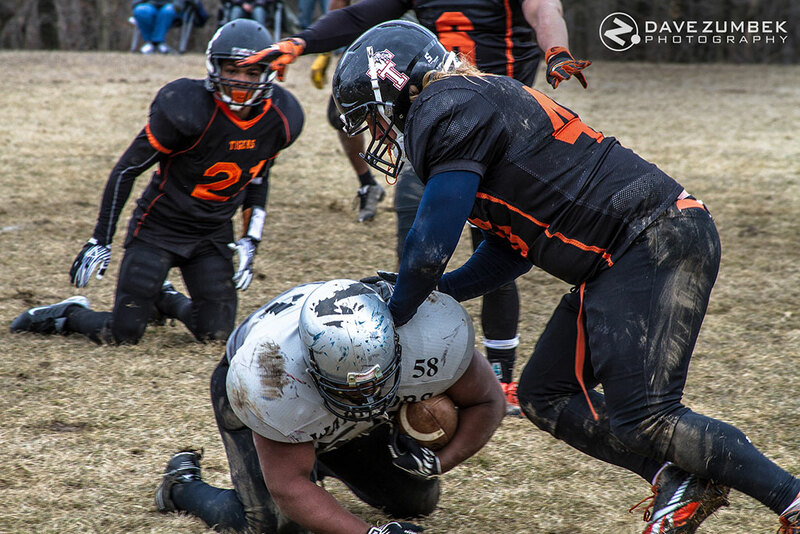 A shot from the game of a Tiger Defensive player tackling one of the Warriors. In addition to my time shooting out in the cold, I spent a few hours editing photos. I created a custom gallery with all the edited images available for sale. I went onto the Tiger’s Facebook page the following Monday to post the gallery link. To my surprise, another photographer already posted several photos to the team’s timeline. She also posted a link to a Shutterfly album with all of her unedited photos and prices completely undercutting mine (my photos come from a pro lab). What was I supposed to get out of this again and why did I waste my time? Imagine you own a construction company and bid on jobs alongside competitors. You land a bid to build a new roadway for a town. Your crew and equipment are gathered and brought to the job site. Upon arrival you discover another company is already set up and working on the road. You are told by the township awarding the bid that you will now be working alongside another company sharing the profits. You planned workers, expenses, and budgets based on what you thought was coming your way as a result of winning the bid. Instead, you are now forced to share the profits. In addition to that, you have to try and coexist with your competitor. Your company is paving with cement, which results in a better quality road. The other company is moving faster using asphalt. The township doesn’t care because they are still getting a road. More of the profits are going to the other company as they are completing their section of the road more quickly and moving onto yours. This was supposed to be a good opportunity for your business, but instead it turned out to be a disaster. 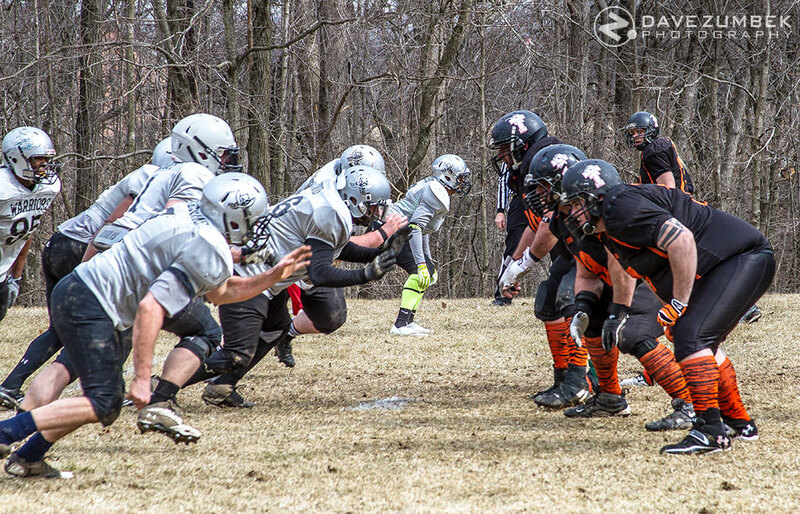 Unexpected competition on the job can be similar to two teams waiting to destroy each other on the line of scrimmage. Perhaps a bad analogy, but the point is the same. By showing up to the team’s Facebook page and seeing another photographer performing the same work, I already lost exposure. I was not only competing for recognition, but also the sale of images. The other photographer took a photo dump off her camera of 300+ images without editing first. Since she spent very little time beyond shooting, she could easily throw her shots on Shutterfly. I ended up spending 2-3 hours editing 60+ images. I carefully select some of the best shots, while also performing the basic post-processing steps. I built a custom gallery with a search engine friendly URL path (for the team’s exposure and mine). I carefully selected print options suitable for sports photography and set the prices starting at $2.99 (normally a competitive price). What incentive did the team and their fans have to purchase prints from me when they could buy a lesser quality version at a cheaper price? After speaking with the team owner who asked me to come and shoot, it turned out to be a misunderstanding. He was not aware of the other photographer until after the game. She turned out to be the mother of one of their new players who was apparently just trying to help the team. There were no hard feelings left from this, but the damage was done. I wasted 4+ hours of my time without much to show in return. I ultimately declined further involvement with the team this season. The risk of having a situation like this occur again was too great. Unfortunately, it was a lesson learned the hard way. This isn’t the first time I have come across issues with other “photographers” on the scene. I tend to see this most often at weddings. The first wedding I was asked to so was plagued with interferences. The problems did not arise from other photographers competing for profit, rather family and friends. The bride and groom did not hire a videographer. Instead, they had someone with a digital camcorder filming the ceremony. This person did not know how to get out of the way. As someone who is providing a paid service, its my job to get the best shots of every key moment. You think a paid photographer would be respected at a wedding, but it wasn’t the case. This so called amateur videographer kept occupying key places I needed to be in order to land certain shots of the ceremony. He also managed to land himself in the frame of many perfectly good shots. I had several great images ruined due to this videographer lurking in the background. This guy was either obliviously to everything around him, or a clever genius intentionally photo-bombing every shot he could. That wasn’t all that happened at this wedding. I had numerous issues with relatives and friends rocking point and shoot cameras. It was an outdoor ceremony with room all around the pseudo alter. The family and friends of the bride and groom literally formed a circle around this alter with their cameras. I had to constantly weave, bob, and dance around these people to get the shots I needed. It was extremely frustrating and resulted in the loss of several great photo opportunities. Then there was the relative and his DSLR. Some people think buying a good camera is all you need to be a great photographer. This guy, filled with a false sense of entitlement, caused much interference by stepping in, taking over shots, and not knowing his place versus mine. My absolute favorite had to be when one of the Bride’s friends stepped in. He literally took the bride away from me after the ceremony during he organized wedding party pics. This friend pulled her off by a tree and started directing some model-esque photo shoot using nothing but his cell phone. I stood in shock for a moment, but then was forced to continue shooting without the bride for 15-20 minutes. For every wedding I do, I have an agreement that I sign along with the bride and groom. Inside of this agreement are several sections addressing other photographers and cooperation from the soon-to-be-married couple. I can do everything within my power to get the best shots and coordinate the wedding party. I will ask others politely to step aside at times when need be. However, its not my responsibility to tell wedding guests what they can and cannot do. If the bride and groom want all the key shots they desire, I need their cooperation in asking their guests to step aside. Either way, I am paid for the wedding. Its the bride and groom that will suffer from such interference when they are missing key shots due to guest interference. Unlike weddings, I wasn’t going to be paid for my time shooting the team. This was a new experience, filled with hard lessons. Its more evident than ever an agreement is needed before any shooting takes place. I approached this opportunity with a relaxed attitude, viewing the shoot as a trial run. I can’t be relaxed. The moment I let my guard down someone will step in and take advantage, as innocent as it may be. If I had an agreement with the owner of the team, this could have been avoided. The other photographer would have been instructed to keep her photos off the team’s Facebook page. If she did post them still, the posts would have been removed from the team’s timeline. I would have had more control over the exclusiveness and wouldn’t have to worry about competing for print sales. This was a learning experience and a lesson that will not be forgotten when similar future situations arise. To see all of the shots from the game, click here.